Jennifer L. Nilsson's whimsical fairy mice make me smile. So when I saw her tweet offering free shipping AND an extra free gift to the customer that bought her 100th item in her Mouser-kins™ Magic shop, I squeaked in excitement and scurried to her shop. Out of all her adorable prints available, the Moon Maiden was my favorite. Besides getting brownie points for being drawn in colored pencils, she has such a sweet face, and matches the celestial themed bathroom at my parent's house perfectly. So I checked out with her and only a few days later received the wonderful package of goodies below. In addition to the ACEO print, Jennifer also sent me a very sweet thank you card, laminated bookmark and sparkly ornament. 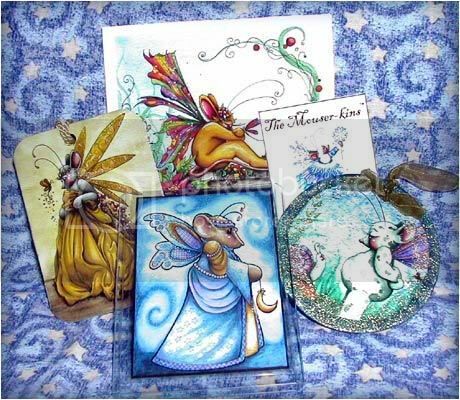 Each item features artwork that is vibrant and expressive, and she has dozens more paintings just as gorgeous. So if you haven't visited her shop yet, what are you waiting for?! As some very famous mice sang, "Hurry, hurry, hurry, hurry!" Jenn is extremely talented. Like Michelle (above), I have 2 gorgeous 8x10 pieces for my baby girl's room...absolutely beautiful!